Among many other celebrities spotted at the beginning of this year&apos;s Art Basel Miami, Rick Ross is one who&apos;s already spending the big bucks. Yesterday, he Instagrammed a photo of himself with North American Chairman and CEO of Recorded Music for Warner Music Group, Lyor Cohen, in front of a 2012 photograph by Richard Mosse titled Love is the Drug. He captioned it, "Just purchased my 1st piece from Art Basel w/my lil homie Lyor. #bossup"
Mosse is a prominent fine art photographer known for coloring his images in vibrant, red/pink hues, often depicting nature and images of conflict in the Congo. Most recently, it was announced that he&apos;s been chosen to represent Ireland at the Venice Biennale. 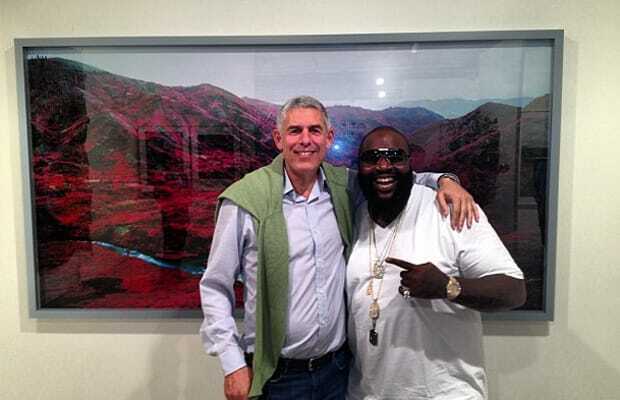 In many ways, Ross&apos; purchase of this incredible image is a true instance of a boss meeting a boss. We were there just before he bought the piece from the Jack Shainman Gallery booth, and we took these photos of the photograph and wall text, as well, so you can see what it looks like without him standing in front of it. Congrats on the purchase, Rozay!